"Scarborough subway" redirects here. For the subway extension proposal, see Line 2 Bloor–Danforth § Scarborough Subway Extension. Line 3 Scarborough, originally known as the Scarborough RT, is a light metro line that is part of the Toronto subway system in Toronto, Ontario, Canada. The line runs entirely within the suburban district of Scarborough, encompassing six stations and 6.4 kilometres (4.0 mi) of mostly-elevated track. It connects with Line 2 Bloor–Danforth at its southwestern terminus, Kennedy, and terminates in the northeast at McCowan. Rather than the larger subway trains used by the other lines in the system, the rolling stock of Line 3 consists of smaller, fully automated, medium-capacity trains, designated by the Toronto Transit Commission (TTC) as the S-series, which are Intermediate Capacity Transit System (ICTS) Mark I trains built by the Urban Transportation Development Corporation (UTDC). The trains are powered by linear induction motors, operating on 1,435 mm (4 ft 8 1⁄2 in) standard gauge tracks, unlike the city's subway lines and the Toronto streetcar system, which use the unique 1,495 mm (4 ft 10 7⁄8 in) Toronto gauge. The line has remained unchanged since its opening in 1985 and contains two of the least used stations in the system. Plans to revitalize and expand it—whether to convert the line to use modern light rail vehicles or to close the line and extend Line 2 Bloor–Danforth further into Scarborough—have been debated for over a decade by the City of Toronto. In September 2013, the Government of Ontario, under Premier Kathleen Wynne, announced it would fund the extension of Line 2 to Scarborough City Centre along a new alignment, which will result in the eventual closure of Line 3. The original streetcar platform can be seen at Kennedy station. This image also clearly shows the pusher plate for the linear motor between the rails, and the two inductive communications wires on either side of the plate. In 1972, the provincial government announced the GO-Urban plan to build an intermediate capacity transit system across suburban Toronto using the experimental Krauss-Maffei Transurban. However, Krauss-Maffei was forced to abandon development when the German federal government declined further funding. GO-Urban then used some of the technologies from the Transurban to develop a simpler steel-wheeled version, the ICTS system. During this period, the TTC had been working on plans to extend its own network with a series of streetcar systems using a new and greatly enlarged streetcar design, the Canadian Light Rail Vehicle (CLRV). The Ontario government, in charge of the GO network, was looking for a test site for the ICTS system, and demanded that the TTC use it for one of their planned streetcar projects, selecting the Scarborough extension. The TTC initially refused to make the change, arguing it was both the wrong solution and that since the construction of the line had already commenced this would be a waste of money. However, as the Ontario government was providing 75% of the funding for the line, they changed their minds when the government threatened to cut the funding. At Kennedy station, there are clues revealing that it was originally built for streetcar operation; it is possible to see old low-level streetcar platforms protruding under the current high-level platforms, and the loop to turn streetcars proved too sharp for safe operation of the ICTS cars, which did not have a reason to turn around, so the loop was replaced by a Spanish solution-like crossover. Ontario wanted to develop and promote its new technology, which had been designed for a proposed urban GO Transit service known as GO-ALRT. Changes to federal railway regulations had made the new system unnecessary for GO, so the government hoped to sell it to other transit services in order to recoup its investment. The Scarborough line opened in March 1985 as the Scarborough RT. Three years after it opened, the TTC renovated its southwestern terminus at Kennedy station, because the looped turnaround track, designed for uni-directional streetcars under the earlier plan and not needed for the bi-directional ICTS trains, was causing derailments; it was replaced with a single terminal track and the station was thus quasi-Spanish solution, with one side for boarding and another side for alighting, though the boarding side is also used for alighting during off-peak hours and weekends. From when the line opened in 1985 until 2015, it was known as the "Scarborough RT" or "SRT". The "RT" in Scarborough RT stood for "rapid transit". Locals have often referred to the line as SRT or the RT for short. The name Scarborough Line is used on the official TTC website and 2014 TTC Ride Guide. In October 2013, the TTC announced plans to give the lines official numbers to help riders and visitors to navigate the system. The line is numbered 3, as it is the third rapid transit line to open in the system. New signage was installed in March 2014. In 2015, the name was simplified to "Line 3 Scarborough" and the TTC began shrink-wrapping the rolling stock with a blue vinyl finish displaying the number 3, a diagram of the Scarborough line, and the TTC logo. The original "RT" logo was no longer featured on the trains, except when the Line 3 shrink wrap is removed but not re-applied yet. With the line approaching the end of its useful life, the TTC reduced the frequency of service in mid-September 2012. In 2015, the TTC started work on the cars to keep them operational until the line is replaced by another mode of rail technology. This includes a new shrink-wrapped outer livery that is almost entirely blue to emphasize the line's colour code, followed by interior upgrades. As of December 13, 2016, with the Presto fare gates installed at Lawrence East station, all stations along this line are Presto-enabled. In April 2017, the TTC awarded a $6.8-million contract to Bombardier to repair corrosion damage under the floors of the SRT cars. If the problem were not rectified, there would be the risk of serious structural damage to the cars. That would have prevented the cars from lasting until 2026 when the Scarborough Subway Extension is scheduled to replace Line 3. Until the work is completed in 2018, service on Line 3 was reduced from 6 four-car trains down to 5. The abandoned loop at Kennedy station, which became a dead-end tail track in 1988. The 7 four-car trains used exclusively on the Scarborough line were developed by the Urban Transportation Development Corporation (UTDC), then an Ontario Crown corporation but later sold to Bombardier Transportation. The business proposal initially bore little fruit—a proposed pilot project in Hamilton was cancelled after meeting widespread public opposition, and the only other transit systems to use the technology, named the Intermediate Capacity Transit System (ICTS), at the time were Vancouver's SkyTrain, and the People Mover in Detroit. After Bombardier took over UTDC, it redesigned the technology with newer, longer cars, used to expand the SkyTrain network and also for new installations across the world. ICTS was rebranded as "Advanced Rapid Transit" (ART) and became a success for the company. Later, the technology was again rebranded, this time as Bombardier Innovia Metro. One unusual feature of the ICTS cars is that they are driven by linear induction motors: instead of using conventional motors to turn the wheels, they push themselves along the route using alternating flat magnets reacting with the distinctive di-magnetic aluminum metal plate that runs down the centre of the tracks. This system requires very few moving parts, and therefore leads to lower maintenance costs. When the car motors are accelerating, they actually lift the car off the track an extremely small distance, repelling against the aluminum plate. This micro-lifting prevents the truck wheels from making a solid electrical contact with the track. Instead of using the conventional method, in which motive power is supplied by a single third rail, with return current travelling through the running rails, a separate positive and negative power rail are provided on one side of the track. With respect to the accelerating trucks and the micro-lifting, the truck wheels have a somewhat larger flange than normal in order to keep the car inline on the track during the micro-lifting. [original research?] The linear induction motors also allow the cars to climb steeper grades than would be possible with traditional subway technology since wheel slip is not an issue. The trains are also able to be operated exclusively by computers, becoming one of the earliest installations of Standard Elektrik Lorenz's "SelTrac IS" system (now owned and delivered by Thales Rail Signalling Solutions), doing away with the need for a human operator. However, due to opposition from the transit workers' union and public perception, operators were retained; the union has firmly opposed driverless trains. (Other systems took full advantage of the automated operation and Vancouver's SkyTrain has been automated since 1985 with no mishaps.) The Scarborough line trains have only one operator, unlike most of the other TTC subway lines, which carry both a guard at the rear, who operates the train's doors, and an operator, who drives the train from the front. (Line 4 Sheppard, however, has used a single operator only since October 2016.) In practice, the Scarborough line trains drive themselves; the operator monitors their operations and controls the doors. One feature, which was not implemented at the time of Scarborough line's opening, is the automated next stop announcement system, which was introduced in January 2008 (which means operators are no longer required to call out stops manually) and uses the voice-over of Susan Bigioni, a TTC employee, identical to those used on the T1-series and older trains. Track is the 5 rail system on direct fixation and car is powered by an induction or "reaction rail" situated between the running rails at the same top of rail elevation. There are two side contacting power rails +300V and −300V respectively situated a distance of about 14 in. from the closest gauge line of one running rail. The two power rails of 300 volts positive DC and the other of 300 volts negative DC together produce 600 volts. The line follows a roughly upside down L-shaped (or gamma-shaped (Γ) when viewed northwards) route: first northward from Kennedy station, parallelling the Canadian National Railway/GO Transit's Stouffville line tracks, between Kennedy Road and Midland Avenue, 4 km (2.5 mi) to Ellesmere Road; then eastward between Ellesmere and Progress Avenue, through Scarborough City Centre to McCowan Road. The Scarborough line's ICTS trains have their own small yard east of McCowan station. This yard is large enough to store the existing fleet, but would have to be expanded or replaced if the TTC were to expand the line's capacity with new trains. Basic maintenance is performed in this yard; for more extensive work the cars are taken to the subway's Greenwood Yard by truck, given the train's different track gauge. The north–south section of the route, where it follows the CN / Stouffville line tracks, is at ground level; the shorter east–west section (except for the ground-level yard) is elevated, as is the Kennedy terminus. The line dives briefly underground just north of Ellesmere station to cross under the CN tracks. After that, it is elevated towards McCowan station. Two stations, Kennedy and Scarborough Centre, are wheelchair accessible. From 2 a.m. to 6 a.m., when the Scarborough line is not operating, the 302 Kingston Rd-McCowan Blue Night bus serves the same area. The 302 originates at Bingham Loop, where it connects with the 322 Coxwell bus that travels to the west, as well as the 324 Victoria Park, that runs north. From the loop, the 302 travels east along Kingston to Brimley, then north along Brimley to Danforth Road, then north on McCowan Road to Steeles. With the exception of McCowan station, it does not pass near any of the rapid transit stations, though other night bus services pass near stations. Bus service is extended on Sundays, because the rapid transit lines start at 8 a.m. (beginning January 3, 2016) instead the usual 6 a.m. start. Service frequency is 30 minutes. The frequency for this line is 4–5 minutes during peak periods and 5–6 minutes during off-peak periods. In 2006, a study was completed on the prospects of the Scarborough line. It recommended upgrading the line to handle larger ART Mark II vehicles, at a cost of $190 million (2006 dollars) with an eight-month service suspension for the upgrade and to purchase $170 million of new rolling stock. Rebuilding the curve in the tunnel north of Ellesmere station would be needed to accommodate Mark II cars. (According to transit advocate Steve Munro, the need to rebuild the tunnel was discovered after the $190 million upgrade estimate was made.) The TTC Board approved the recommended plan to upgrade the SRT on August 30, 2006. Later, the TTC cancelled the plan for modernizing the SRT. Extending Line 2 Bloor–Danforth, either along the current route or along a different alignment directly to Scarborough Centre, was not considered cost-effective or justifiable. In November 2015, transportation consultant and University of Toronto professor emeritus, Richard Soberman, argued that it would be vastly cheaper and faster to buy new SRT vehicles than to replace the SRT with an extension of Line 2 northeast from Kennedy station. He felt the cost savings would be great enough to overcome difficulties such as the incompatibility of Mark II cars on the existing line and the extra cost of building a fully separated right-of-way to the Sheppard East LRT. The TTC and the City of Toronto completed an environmental assessment in 2010 to convert the line to light rail transit and extend it to Malvern from its current eastern terminus, McCowan, with potential new intermediate stations at Bellamy Road, Centennial College and Sheppard Avenue with a possible additional station at Brimley Road between the existing Midland and Scarborough Centre stations. After initially planning to include the line with the proposed Eglinton Crosstown LRT line and create a single line called the "Eglinton–Scarborough Crosstown line", Metrolinx proceeded with plans to convert the line to light rail and extend it to Sheppard Avenue with a single new intermediate station at Centennial College. The existing line would have closed after the 2015 Pan American Games and be completed in 2020. In January 2013, Infrastructure Ontario issued a request for qualifications to shortlist companies to construct both this line and the Eglinton Crosstown line. In June 2013, Toronto City Council again debated to have the Scarborough line replaced with an extension of the Bloor–Danforth line north to Sheppard Avenue along a different right of way. Metrolinx issued a letter to Toronto City Council indicating it would cease work on the Scarborough portion of the line, because its position strayed from the original LRT agreement. The subway alternative would cost between $500 million and $1 billion more than converting the Scarborough line to use the same rolling stock as the Eglinton Crosstown line be so it could be a continuation of that line. The Globe and Mail reported that Scarborough councillors had argued that providing Scarborough residents with light rail, not heavy rail, treated them as "second class citizens". Two competing subway plans were proposed to replace the Scarborough line. TTC Chair Karen Stintz proposed to extend the Bloor–Danforth subway line to the east before turning north with three new stations at Lawrence Avenue and McCowan Road (primarily to serve the Scarborough Hospital's General Campus), at Scarborough Town Centre and then at Sheppard Avenue East and McCowan Road, where it would connect to the Sheppard East LRT. Transportation Minister Glen Murray made an alternative proposal to extend Line 2 along the route of the current Scarborough line but terminating at Scarborough Town Centre. Under the Murray plan, there would be only two stations and there would be no direct connection with the Sheppard LRT. The Murray plan would have required the relocation of Kennedy station as a new northbound curve from the existing Kennedy station would have been too tight for subway trains. The Murray plan would also have required the complete shutdown of the line during construction, something that the Stintz plan avoided. On October 8, 2013, Toronto City Council voted 24–20 to replace the Scarborough line with a three-station extension of the Bloor–Danforth subway line. Council chose the Stintz plan for the extension. The city will borrow money to pay its portion of the subway extension costs. The increases in property tax and development charges are to pay off this debt over a 30-year period. In July 2015, Jennifer Keesmaat, Toronto's chief planner, questioned the accuracy of a 2013 city staff report that estimated ridership at 14,000 riders per peak-hour instead of the earlier 9,500 per peak-hour put forward by the TTC. City Council based its decision to choose a subway extension over an LRT conversion based on the higher number. In June 2016, city planning staff proposed to eliminate two of the three stops along the planned Scarborough Subway Extension terminating Line 2 Bloor–Danforth at Scarborough Town Centre in order to free up funding for a proposed Crosstown East LRT line. The eliminated intermediate stops were at Lawrence Avenue and Sheppard Avenue. However, subsequently the cost estimate for the one-stop subway extension increased to $3.2 billion leaving the Crosstown East LRT unfunded. Given the rising cost for the subway extension and the loss of funding for the LRT line, a group of city councillors led by Josh Matlow reopened the subway versus LRT debate. Matlow proposed scrapping the one-stop subway extension in order to provide funding for 24 LRT stops on two LRT lines within Scarborough. TTC CEO Andy Byford said the cost of the LRT line following the SRT route may have risen to as high as $3 billion because of "delays and redesign" since 2013, but Brad Ross also of the TTC warned of "caveats around numbers and assumptions" associated with that estimate. After Council's vote, Byford admitted that the cost estimates for "delays" was unnecessary, which assumed the LRT's completion would be in 2026, the same date as the subway option. However, according to Michael Warren, a former TTC chief general manager, the LRT could have been completed in 2020 at a cost of $1.8 billion, an estimate not presented to City Council when it voted. There was also the issue whether there would be space for both expanded GO service and an LRT north of Kennedy station; however, Metrolinx subsequently denied there would be such a problem. On July 13, Toronto City Council voted down Matlow's proposal by a margin of roughly 2 to 1. Councillor Glenn De Baeremaeker justified the subway extension saying "Scarborough residents need the same access to a subway system that everybody else already has." Mayor Tory was concerned that switching from subway to LRT would delay transit improvements in Scarborough, and might not get support from senior levels of government. In September 2013, Metrolinx prepared a draft report comparing the subway and LRT options concluding that the subway option was "not a worthwhile use of money." Metrolinx had declined a TTC request to give an opinion prior to City Council's July 2016 vote. ^ This was only for the 5 existing stations, with no extension. Work included extending existing stations, moving Kennedy platforms to ground surface, and included $170 million for buying 44 new longer cars. The additional 2 station extension to Malvern was priced at about $500 million. ^ This was only for the 5 existing stations, with no extension. Work included extending existing stations, and included $120 million for 24 vehicles. ^ This was for a two-station subway with stops only at Lawrence East and Scarborough Town Centre. Costs were $1.1 billion for subway and $100 million for cars. ^ In October 2016, the City agreed to assume operating and maintenance costs for all LRT lines. Thus, in hindsight, the City would have been responsible for these costs for both the subway and LRT options. One of the TTC's redevelopment proposals for the Line 3 lands is to convert the corridor, including the elevated section between Midland and McCowan stations, into a linear park. This proposed park would be similar to the High Line in Manhattan, New York City. ^ a b "Toronto Transit Commission Subway ridership - 2018" (PDF). Toronto Transit Commission. Retrieved March 9, 2019. ^ "2011 TTC Operating Statistics". Toronto Transit Commission. Retrieved March 10, 2013. ^ a b "Scarborough subway to be built with shortened route, Ontario announces". The Globe and Mail. September 4, 2013. Retrieved September 4, 2013. ^ "Scarborough subway confirmed by Toronto council". Toronto Star. ^ "GO-Urban's bright future fades suddenly". Toronto Star. November 14, 1974. ^ "Frequently Asked Questions about Toronto's Subway and the Scarborough RT – Transit Toronto – Content". Transit Toronto. 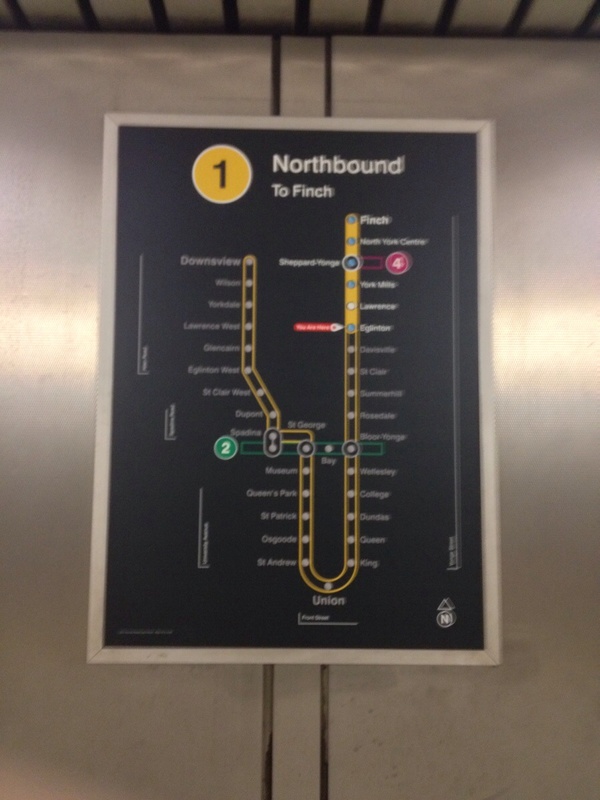 ^ "New TTC Signage at Eglinton Station". ^ "Chief Executive Officer's Report – November 2012 Update" (PDF). Toronto Transit Commission. November 21, 2012. Retrieved March 10, 2013. ^ "This is what the TTC's revamped SRT cars look like". BlogTO. Retrieved March 10, 2015. ^ "Presto on the TTC". ^ Spurr, Ben (April 18, 2017). "Scarborough RT vehicles need repairs to avoid 'catastrophic' corrosion failures". Toronto Star. Retrieved April 19, 2017. ^ Boldea, Ion; Nasar, S. A. (2001). Linear motion electromagnetic devices. ^ Bruser, David (November 17, 2006). "TTC eyes driverless subway". Toronto Star. Retrieved December 8, 2007. ^ "Request for Information (RFI) For Rail Milling Services RFI No. R31CA15135" (PDF). Toronto Transit Commission. April 28, 2015. Retrieved June 8, 2017. ^ Bow, James (June 3, 2017). "The Scarborough Rapid Transit Line". Transit Toronto. Retrieved June 8, 2017. ^ a b c d e "Scarborough RT Strategic Plan" (PDF). August 30, 2006. Retrieved March 9, 2012. ^ a b c d e "Scarborough RT Strategic Plan – Study Report – Final Report – August 2006" (PDF). August 2006. Archived from the original (PDF) on June 25, 2008. Retrieved August 5, 2013. ^ a b "Minutes of the Previous Meeting – Board Meeting Minutes – Meeting No. 1873 – Wednesday, August 30, 2006". September 20, 2006. Retrieved December 1, 2015. ^ Moore, Oliver (March 17, 2017). "What has gone wrong since the 'golden age' of Toronto transit". The Globe and Mail. Retrieved April 24, 2017. Dr. Richard Soberman, former chair of civil engineering at the University of Toronto, would simply buy new rolling stock for the SRT and rebuild a bend to accommodate new vehicles. ^ Munro, Steve (March 1, 2017). "Scarborough Subway Cost Rises Again". Retrieved April 24, 2017. At the time [the report] was written, the cost estimate was $360 million. ... At this point it was assumed that the larger Mark II Skytrain cars would fit through the Ellesmere tunnel, but this was optimistic. ^ a b Kalinowski, Tess (November 15, 2015). "Skip the Scarborough subway and modernize the SRT, says transit expert". Toronto Star. Retrieved November 20, 2015. ^ "Extension of the Scarborough Rapid Transit & Kennedy Station Improvements". City of Toronto. May 29, 2012. Archived from the original on October 6, 2012. Retrieved March 10, 2013. ^ "Request for Qualifications Issued for the Eglinton Crosstown LRT and Scarborough LRT Lines". January 22, 2013. Retrieved March 10, 2013. ^ Moore, Oliver (July 2, 2013). "Metrolinx to Toronto: Subway is yours". The Globe and Mail. Retrieved July 3, 2013. ^ a b "Scarborough subway confirmed by Toronto council". Toronto Star. Retrieved October 8, 2013. ^ Pagliaro, Jennifer. "Real costs of Scarborough subway, cancelled LRT to resurface at council". Toronto Star. Retrieved July 24, 2015. ^ Pagliaro, Jennifer (January 20, 2016). "New Scarborough transit plan 'buys peace in the land'". Toronto Star. Retrieved January 20, 2016. ^ a b Pagliaro, Jennifer (June 28, 2016). "Scarborough subway versus LRT debate to return to council amid transit confusion". Toronto Star. Retrieved June 30, 2016. ^ a b c Pagliaro, Jennifer (October 24, 2016). "How a bid to resurrect Scarborough LRT was killed: Analysis". Toronto Star. Retrieved October 24, 2016. ^ Pagliaro, Jennifer (October 25, 2016). "Watchdog says city staff may have violated public service code over Scarborough subway advice". Toronto Star. Retrieved October 24, 2016. ^ Warren, R. Michael (October 26, 2016). "Was the memo that killed the LRT deliberately misleading?". Toronto Star. Retrieved October 26, 2016. ^ Moore, Oliver (July 13, 2016). "Toronto City Council approves planning for raft of transit projects". The Globe and Mail. Retrieved July 14, 2016. ^ Spurr, Ben; Pagliaro, Jennifer (June 1, 2016). "Mayor Tory defends Scarborough subway extension despite new ridership data". Toronto Star. Retrieved June 1, 2016. ^ Tory, John (June 27, 2016). "Why I support the Scarborough subway: John Tory". Toronto Star. Retrieved June 27, 2016. ^ a b "Scarborough councillors seek subway line instead of LRT". Toronto Star. Retrieved May 6, 2013. ^ a b c "Not in service". TheGrid. Archived from the original on October 17, 2013. Retrieved October 16, 2013. ^ a b c d e f g h i Pagliaro, Jennifer (August 7, 2015). "Scarborough subway debate suffers from lack of facts, community groups say". Toronto Star. Retrieved November 19, 2015. ^ "Mayor Tory defends Scarborough subway extension despite new ridership data". Toronto Star. Retrieved June 2, 2016. ^ The SRT is traditionally described as having 6 stations – but that includes Kennedy station. The replacement proposals only list the additional stations, so this should be 5, for consistency. ^ "Options for Scarborough RT Replacement – CodeRedTO". coderedto.com. Retrieved July 14, 2016. ^ Pagliaro, Jennifer (July 13, 2016). "Toronto city council sticks with subway, rejects Scarborough LRT". Toronto Star. Retrieved July 13, 2016. ^ Spurr, Ben; Pagliaro, Jennifer (October 31, 2016). "Report reveals new transit lines' steep cost for Toronto". Toronto Star. Retrieved November 3, 2016. ^ "TTC looking at making a park out of Scarborough RT". Toronto Sun. February 21, 2015.